Beautiful Algeria: The Food, the people, the regions. Ya Rayi is in their database. Global voices aims to be a useful resource for news editors and wrtiers. You'll find blogs full of local detail you can't find elsewhere. A blog by an artist, singer and writer. And saw the land for which my life had yearned. I laughed as one who some great prize has earned. Piemonte is slowly becoming mine. I am not only coming to understand the “how” of the Piemonte but I am beginning to appreciate the “why”. In a month or so this blog and my Algerian cuisine blog will be organized differently. The new format will be visually cleaner and easier to read. Look for more contributors as well as videos and podcasts from around the world. The internet is merging (has merged) with different forms of media. The future of food is the internet. As usual our goal is to focus on food as it relates to history, culture, arts, economics, politics, education, etc... plus some fun stuff thrown in to keep your attention. Join www.bookofraiforum.com to post about what you know and to ask questions about what you do not know. It is as simple as that (probably not so simple). Book of rai forum is a friendly place to share, to learn with an open mind. We have some interesting topics and projects such as 18th century cooking in Mexico and the Philippines, the foods of Africa and the African diaspora*, Medieval cookery, The Spanish Lake, etc, If you have a research question post it on the forum, chances are you will recieve feedback. *This is leading into a documentary series with a group of chefs and writers of African descent from around the world. Please help identify this mystery fruit. Discussion on bookofraiforum . 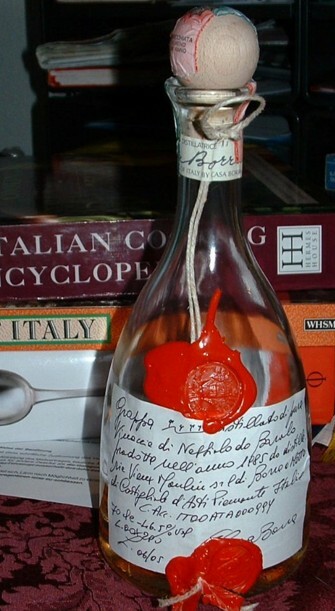 I would have to admit that I am more of a rhum and cognac man, but in the last 8 or 9 years I have become interested in grappa, mostly because of my discovery of the Italian kitchen. When we were in the Piemonte in October we had the good fortune to visit a grappa distillery called Vieux Moulin which you can’t miss if you drive along the road from Asti to Alba because there are several large signs pointing the way. The place is pretty unassuming, there is a big dog chained-up in the court yard who heralds your arrival with a never-ending series of barks and the whole place has a pretty home-spun air about it. From ingenious vegetarian offerings with a wide range of flavors to the elegant meat-centered feasts of Mogul emperors, India’s culinary traditions are rich, and as varied as her land and people. The country’s geography and climate ranges from landlocked high altitude mountains, to fertile river valleys, to arid plateaus, to verdant tropical coasts. In times past food production was totally dependent on geographic and climatic conditions, from which evolved the various peasant cuisines of India. Until the British conquest at the end of the eighteenth century, each region of India was ruled by its own royal family and each had its own provincial language, local customs, culture, and unique cuisine. The proficient palace chefs of these small independent kingdoms perfected the many elegant palace cuisines of India. India’s population is very diverse and they follow many different religions. Food related taboos differentiating the sacred from the disrespectful are taken very seriously. Hindus and Sikhs won’t eat the sacred cow. Strictly vegetarians, mostly Brahmins, and Jains refuse even the spices associated with the preparation of meat, such as onions and garlic. The descendants of the Moguls of Delhi and Punjab, being Muslim, refuse pork, but are great experts in the preparation of meat dishes. Christians of India have some excellent beef and seafood dishes. The Muslim influenced Tandoori dishes of Mughal cuisine with its unique technique of marinating meats and vegetables with a careful blend of choicest spices and aromatic herbs have been a gourmet's delight the world over. With the migration of Indian workers to the west during 18th and 19th centuries, the tandoori preparations of Mogul cuisine and the hardy food of the Punjab region were the first to reach the western world. Even today this is the type of food that is served in most Indian restaurants abroad. Mahmud of Ghazni (modern Afghanistan and northeastern modern Iran), lured by tales of the fertile plains of the Punjab and the fabulous wealth of Hindu temples first attacked northern India in 1000 AD. The Mogul emperor Baber conquered India in 1526 AD and this Muslim dynasty ruled in an unbroken succession for nearly 200 years. North Indian food went through a profound transformation during this period. Meats and breads grilled in clay ovens called tandoors and elaborate dishes – Kababs, pulavs and biriyanis - and sweets garnished with thin sheets of real gold and silver became the mainstay of Mogul banquets. Many years before the advent of central Asian Muslim invaders to the northern frontiers, coastal region of the Indian Ocean between India, the Persian Gulf, East Africa and the China Sea was an area of active commercial exchange. People along these coasts, blessed with wide open waters and natural harbors, excelled in maritime trade with distant lands. Indian merchants and the inhabitants of the Persian Gulf regions were active traders and intermediaries long before the birth of Prophet Muhammad. For Europe and central Asia, spices were the envoys from enchanted orient. From ancient times, the monsoon soaked rain forests, home to several spices, especially black pepper, became a prime destination for many explorers. Ancient southern Indian kingdoms enjoyed a flourishing spice trade with the Arabs of coastal Yemen and Oman. By the early Christian period south India was transformed into a commercial hub linked to the West and the East through emporiums located along the coastal and inland routes. Spice trade was as profitable an undertaking as it was complex. When the maritime trade routes spread beyond the Nile and Euphrates, Greeks, Romans and later the Portuguese ventured to trace new routes to the source of spices and exotic things. However, the old Arab channels of trade continued to flourish thanks to the age-old alliances and agreements between the original Arab and Indian traders. Interestingly cinnamon, the spice that made fortunes for the Arab traders in earlier times still remained an Arab monopoly. The Romans could find it only at Arab ports; the source of cinnamon in India was scrupulously guarded from them. Throughout the Malabar Coast the Romans were offered only malabathrum, the leaves of the same tree that produced the fragrant bark. Such was the loyalty between the ancient traders of the Indian Ocean. I know I've been promising to organize this blog and the other one as soon as possible. The thing that is holding me back is the potentional rise in web fees. Some days both blogs get a combined page view count of up to 4000 and the blogs are pretty new, that plus projected readership growth and the forum can potentially translate into exorbitant web fees. Those are the reasons for the delay. I'd like both blogs to be organized more like this blog. Posting on certain food forums is a great way to make some contacts and to exchange information. However the really knowledgeable people are easier to find in the blogsphere and I hope more food bloggers join the forum I started. To keep your name as writer out there, you really must blog. The future of food is here and it is blogging, they have search engine supremacy over more static appearing websites. There is absolutely no other medium through which the contributors here could have reached an audience that densely covers North America, Western Europe, the Mediterranean countries, the Indo-Malay archipelago, Australia and to a lesser extent South Asia, North Africa and Latin America so fast. If you are concerned about google and yahoo's projects to make available cookbooks online, divert the traffic to your blog or if you do not have the energy to start your own blog, contact me about posting occasionally here. www.bookofraiforum.com discuss cuisines and cultures. Naengmyun is a Northern Korean cold noodle dish from the Pyong-an-do and Hamgyong-do provinces. Traditionally naengmyun was enjoyed during the winter. Pyong-an specializes in mul naengmyun made from buckwheat noodles and a pheasant and beef broth with radish kimchi juice added. Hamgyong specializes in bibim naengmyun made from starch noodles with Hong Hwe or seasoned flounder. Mul means "water" or "liquid" and bibim means to "mix". As the dishes traveled further away from their origins, Koreans from other regions began adding different ingredients soon naengmyun became a summer time favorite. My mother learned this dish through an "adopted" relative from North Korea who opened a restaurant in South Korea shortly after the war. It's hard to imagine now, but 30 years ago the restaurant scene in Seoul was a fraction of what it was now. It wasn't really until the Olympics that Seoul began exploding into the dense, vibrant city it is now. The three most important sauces in Korean cooking are kangjang*, toenjang** and koch'ujang***. All are made with meju, blocks of fermented soybean paste. Commercially packaged meju comes in different sizes and forms, from pellets to powder. The basic stocks are white beef stock and sun dried anchovy stock. Chicken stock is NOT common at all. And there is no such thing as vegetable stock in authentic Korean cooking. Authenticity is a tricky word and I do not have a single benchmark for it. How is that for straddling the fence? I will try to place recipes within context. That is the best I can do in terms of what is authentic or not. Beef stock is also more of a restaurant item in Korea. Korea is a soup loving country and bones are in high demand. The last time I was in Korea about 4 years ago the beef bones were just as expensive as the best cuts of meat. And the price of beef had just started to become more accessible. Beef stock as a home pantry item is more of a Korean-American thing. In the past in Korea it was more for the wealthy and it still is for the most part. I have been collecting, and have had a great interest for some years now, in the Medieval feasts of Morocco which were much the same as any Islamic Feast using many of the same foods, techniques and recipes . I have a virtual, no pun intended, library of Moroccan/Islamic Medieval recipes which I have not shared before. It has been a fascinating hobby of mine; if you like. I have spent years accumulating a digest of recipes, information, very old cookbooks and a wealth of knowledge from this period in time. I must say that I have always had an interest in Medieval Histories and Ancient Histories from the time in junior high school when I had to do a "Rosetta Stone" in clay for a history class; I was thirteen years of age. As I remember, I only had hot pink clay at home but I must say that it made quite a lovely piece! I received an A for the project. Mr. Tucker was proud and a wonderful history teacher, most probably the best teacher of history that I have had in all of my extensive schooling. My interest, appreciation and love of history was sparked at a very young age by my dad; the King of Historical Fiction, Civil War Battlefields, and lover of history. His interests are quite like mine and include Civil War America as a great passion of his. That, Civil War America, I have to be honest bored me silly at the time, though as an adult I now appreciate greatly his family treks through the Civil War Battlefields, on our way to Disney World each winter, and places such as Jamestown, Old Sturbridge Village and Yorktown. Along with museums new and musty old. The Smithsonian didn't hurt either! Gettysburg I missed as I was an adult by then and living in Great Britain at the time. I remember now how I could feel the fallen soldiers under my feet at Yorktown at four years old and how powerful that was and still is for me. I too am now a lover of that period in American history. Instead of nothing but memorizing and writing dry timelines in school, my dad made history livefor me. Thank you dad for history and Joshua Chamberlain! Anyone who has ever read a Korean tourist brochure knows that kimchi connects the Korean people to our ancestors, our land, our children, our culture, our sense of identity and past struggles for survival during the bitter cold winter months. To say that kimchi is a cultural icon to Koreans is a bit of an understatement. It might not be an exaggeration to say that kimchi is a part of The Korean cosmos. I can't find the source of this quote, "As one eats kimchi, one eats the universe, and in so doing becomes part of the universe and the universe becomes a part of man." Kimchi is also touted as a cure-all, mostly coming from Korean sources. Food writers have waxed poetic about the health benefits which sometimes include elaborate charts. Lots of energy and money are spent on scientific studies about kimchi. Most recently bird flu, before that SARS. I haven't read the papers, I'm not sure how the birds were fed kimchi*. Thanks to Alan Alda's MASH** and Veterans from the Korean War, the most famous kimchi in America with the over 50 crowd seems to be "the buried in the ground" winter kimchi. This type of kimchi is still made, but mostly in rural areas. Anyone who has been to Seoul in the last 20 years or so will know that it's difficult to find a spot to dig a hole in the ground without a concrete drill. Even 30-35 years ago in Seoul my family never made this type of kimchi. I do remember some of our neighbors making it though. The (in)famous "buried in the ground kimchi" is kimjang, the most prized version is from Northern areas. The seasoning tends to be milder with more refreshing kimchi "juice". Kimjang is a topic for a whole other post. In reality the most ubiquitous kimchi is baechue kimchi or nappa cabbage kimchi. DO NOT approve comments to your posts. I will do that. Recently there have been alot of spam comments. Spam comments containing advertising or potential viruses that can do damage to the blog. I'm not sure if "virus" is the correct word, but I've participated in forums for bloggers where there has been discussion of spam comments having deleted entire blogs! I back up the data frequently but to put it all up would be really tedious and time consuming. I hate and detest "goodbye" and always have; I refuse to say it. So, many years ago I taught Mohamed to say "bye bye for now" he later added "only for now." Why do I hate this word so? Simple, one word answer; permanence. Goodbye seems permanent and final to me like that last page of a book or the final scene of a film. No, not a word for me. I invite Korean bloggers to join book of rai forum as well as the readers from the University of Hawaii who have been following this series. I'll be posting some different Korean recipes in the forum. Gaejang is an intensely flavored dish. It's piquant with hot fresh peppers and red pepper flakes. The texture of the raw crab is a bit slimy and rich. If you're concerned about eating raw crab then don't eat this. I've been eating gaejang since I was a child and have never had a problem. I've also made this with frozen blue crab many times. The demographics change according to the time of day. I thought it would be fun for the readers and contributors to see a "random" sampling of visitors. We thought you might like to know about a clothing sale that the Chez Panisse Foundation and dosa are organizing this Sunday. It will benefit the School Lunch Initiative. I don't know if the place actually serves Thai Hot Dogs, although it would not surprise me. I've never heard of a hot dog with "Thai flavors" but stranger things have been concocted like pastrami burritos. Most likely they serve casual Thai dishes and the new owners simply did not bother to take down the hot dog on top of the structure. When I have more time I'll take a look at the menu. I took the photo through my car window. I'm also posting photos of architectural oddities and peculiar juxtapositions here along with photos of where people shop for food in Los Angeles County, everything from produce trucks, farmer's markets, gourmet shops to so-called ethnic markets. Click on the link to see a colorful concrete block building next to a Korean Buddhist Temple next to a craftsman home. I also started a thread on Filipino groceries and restaurants around the world. I am the LA correspondent for a group of Filipino food bloggers. I have an Olympus Stylus 800 and a nifty Olympus SLR, both cameras can take high quality photos. All the shots you've seen so far were taken hastily, sometimes while driving! I don't really have the time to do more. But if there is a specific request I will take the time for better quality photographs. My focus is primarily on Korea Town at the moment, but I want to go into different parts of LA County to present a more complete picture of Los Angelenos. No, I'm not working on a rice post. Well, not yet. I just want to show the pictures of what I found out earlier. The photo on the left is of regular lowland irrigated rice while the one on the right is rainfed lacatan malutu or red-husked glutinous rice used for duman. These were taken months apart but the sheafs of grain are approximately of the same age. In most, if not all Filipino languages, we use different terms to distinguish unhusked rice from milled and then cooked grains. In Kapampangan (a language of Central Luzon), these are palé, abias and nasi respectively (palay, bigas and kanin in Tagalog). There would even be other terms for cold rice, crusty rice found at the bottom of the pot, and so on. But for now, we'll stick to the first three terms mentioned earlier. Now, this is where we enlist reader participation. What do you call rice in your language(s)? Are there different terms like those mentioned above? Let us know, we'd love to hear from you! Book of Rai forum seeks to foster cross-cultural, inter-disciplinary dialogues about food. It evolved from this blog which evolved from frustrations with certain food forums. So why start another one? I feel there is a place for a more inclusive and focused forum with hosts and moderators who are passionate about their fields of interest. If you would like to be host or moderator contact any existing host or moderator via PM or email. It’s as simple as that. Post about what you know, if you don’t know ask a question. I'll be emailing people to join over the next few weeks. Those of you who are familiar with English language food forums will recognize some members, but I think many will be surprised by many more fresh faces and voices to the world of food forums. We set out on a foggy Monday morning for Italy, specifically we were headed towards the Piedmont but because we found an interesting Gasthaus for sale on the internet our trip down was slightly a roundabout one, taking us first through Zürich and then down the south-side of the Zürich See and over to the little town of Sattel to have a look at the dying 150 year-old Gasthaus Krone which is now offered for sale. The place was one of those old Grand-dames now long since faded and the price of restoration could easily triple the pruchase price and since the place was positioned between the main road and a railroad track we decided it was not the right place for us to open up a quiet B&B. So after a polite “thank you for your time, but it’s more of a project than we had in mind” we hopped in the car and headed south, skirting around the Vierwaldstattersee towards the Gotthard tunnel. The lake and mountain scenery here are absolutely breathtaking and it was all in prime Fall colors when we drove through. This region is truly the heart of Switzerland. It is the place, where over 700 years ago the forefathers of Switzerland made the pact to swear allegiance to fight together against the Habsburgs for independence, thereby founded the original “Confederation of Switzerland”. Our goal was pretty simple really. We were headed to the tiny vineyard-town of San Martino Alfieri which is halfway between Asti and Alba in the heart of Piedmont. Ancient and tiny, San Martino has streets barely wide enough for a car to pass. Alfieri is well known for the lovely Alfieri castle, which now produces very fine wines, but it was once famous for producing very aristocratic poets and architects. On Thursday, we will cross its thresholds for the first time because the owner of our casa works there from time to time and has arranged an appointment for us to visit with the wine maker and tour the cellars. I thank everyone who has emailed me about the blogs with their kind supportive words. If you have questions, comments or suggestions I encourage you to post them in the comments field. The contributors appreciate feedback and if you email me I am the only one who gets to read it. I know that some readers use translation software. Babelfish will not give you precise translations but it is good enough to get a broad idea about the content. There are two translation forums I know of Word Reference and International Forum. I don't know much about them but the Arabic and French translation assistance seems to be very good. Word reference also seems to be more moderated than International Forum is. I'd like to introduce another writer to Ya Rayi Our Rai by linking to a post about fasting during Ramadan. Click on the gallery to see the wonderful work by artist Sadia Salam. I'm bumping up this post to add some new countries. I'm trying to add a mapstats link to this blog. 10. We've been getting more page views from Finland, Norway, SLovenia and The Ukraine. 11. We haven't gotten many, I mention it just for fun. South Africa, Ghana, Mozambique and Senegal! 12. Many other countries but the number of page views is not noteworthy yet. I tried installing one of those visible visitors by country and for some reason it came out scrambled and messed up the site. It took me several hours to fix the site each time I tried. where do you get your food? With Thanksgiving coming, we thought you might like to know how to order a Heritage Turkey. The Bourbon Red and the American Bronze are two of the several historic breeds of turkey that our forebears ate before the market was monopolized by the Broadbreasted White, developed in the 1950s and now the sole variety in large-scale production. The Bourbon Red and the American Bronze have firmer, darker meat with much more pronounced turkey flavor than the standard bird; they are both delicious. Frank Reese Jr., whose turkeys are directly descended from the birds of the 19th century, and his coalition of five small-scale turkey farmers are growing these birds, and Heritage Foods USA is helping to distribute them. They deserve our support! Life goes on in a small town in rural Philippines. All manner of modern conveniences are embraced to make life easier. Once a year however, specifically when the winter winds from Siberia blow down on the tropical islands, the townsfolk pay homage to the traditional way of producing a light golden green rice cereal from half-ripe red-husked glutinous rice called lacatan malutu. What has turned into a grassroots festival is steeped in the Filipino culture of bayanihan (cooperative effort between neighbouring farms) during harvest season where singing and guitar-playing accompany the rhythmic pounding of the mortar and pestle. The task that is by nature arduous is lightened by camaraderie and merry-making. I wrote about last year’s Duman Festival on my blog. This year, I’m making good on my promise to document the process of bringing it from the field to the table. In fact, I was out taking pictures of the lacatan malutu yesterday, with my two companions comparing (regular) rice leaves and stalks with those of the lacatan. Most of the documentation will be on the festival website but I may update this entry from time to time. In May 2001, while walking in Seattle, Washington's Chinatown, more commonly called the "ID" or International District because of its pan-Asian and African-American communities, I passed a store selling imported Chinese provisions. Once-new merchandise had long ago faded in the sun and turned antique. I sidled past, but intricate, grapefruit-skin yellow shelving caught my eye. In I went, through the heavy wood and glass doors, sounding a bell. The nearer of two Chinese gentlemen watching television in folding lawn chairs in a back room rose, and started toward me, while I scanned the old wooden shelves partially full with canned goods, cleaning implements, clothing and a variety of imports. A homemade galvanized steel tea caddy with matching scoops proffered a dozen different loose teas; a metal rack displayed Asian flower and vegetable seeds; there were herbal medicines of every description, and lots more. Alice thought you might be interested in two special dinners that we will be hosting at Chez Panisse. WELCOME TO CHEF ISMAIL'S REBUNG! Mark your spot on Tana's food map of the world!